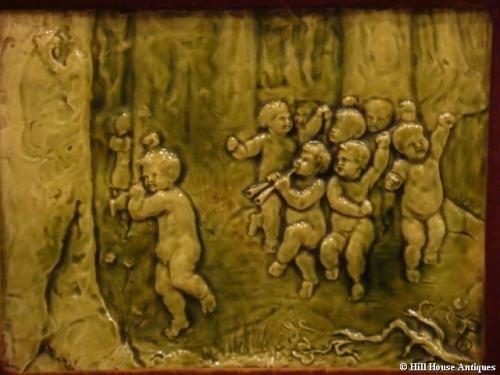 A rare and very large American "Art" Tile by J&JG Low (1877-1902) of Chelsea, Massachusetts. USA, c1882 designed and created by the English modeler, Arthur Osborne (monogramme to tile). These were primarily American versions of the Aesthetic Movement moulded tiles that were made in England at Minton`s and Maw. Known as "plastic sketch" tiles, an oversized tile panel made of wet, or plastic, clay, which was very time consuming and technically difficult to create. Housed in what appears to be its original velvet covered frame; these were sold as fine art in their time. They represented the best of Amercian tiles of the period. A rare suvivor. Approx 19.5" high and 22.5" wide including frame - 10.5" high and 13.5" wide visible tile area - one of the largest sizes made. For further reference see Miller`s Guide to American Art Pottery by David Rago & Suzanne Perrault pages 78 & 79.